D-STAR explained. I first came across this article in Aug 2018 while searching for info about DPRS and DStarMonitor△. It contains some good info about the early years of D-STAR. The author isn't identified and there's no publication date, though it contains a reference to a 2016 satellite launch, so it was written or edited fairly recently. On the other hand, it doesn't contain any info about MMDVM or any of the hotspots that support D-STAR and have been released in the last few years, so it appears it's not being maintained. 2016 D-STAR Forum at Dayton△. Presented by Ham Radio Now's Gary Pearce, KN4AQ, hosted by John Davis, WB4QDX, with presentations by Ed Woodrick, WA4YIH, of D-STAR Info, Jim Moen, K6JM, and John Hays, K7VE of NW Digital Radio. D-STAR Gateway System (REGIST)△ – If you don't have a local gateway system to register with, you can use this. A good place to find a current list of D-STAR nets is D-STAR Info's list of nets△. What follow is some nets I've come across and enjoyed, but there's no guarantee that they're still active (please let me know if they aren't). DCS, DMR, and CCS7 are quite intertwined. 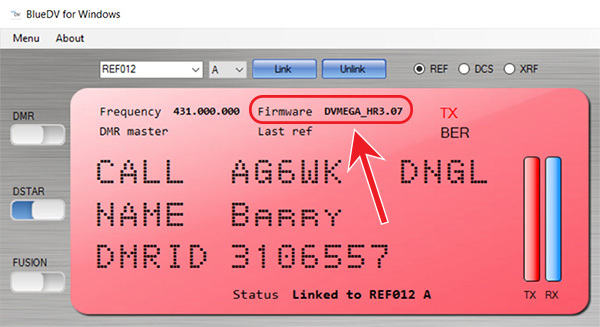 They all use the same registration form, and DCS and DMR share the CCS7 ID. Download Raspbian△ from Raspberry Pi Foundation. Security update for older versions of Raspbian Pixel△ - addresses security concern related to SSH and the "Internet of Things" vulnerability. To disable SSH manually: use raspi-config or the Raspberry Pi Configuration application (instructions△). This tip comes via Kai Gunther, LA3QMA. With the mic attached to the radio, press the PFx button you programmed, and a 240 × 180 pixel bitmap (BMP) screen capture will be taken and stored on your microSD card in a folder labeled "CAPTURE" with a filename that is the date and time & an incrementing number. Connect the radio to a PC via USB. Access menu 980: Interface > USB function. Note: As of late 2018, I no longer have a DVMEGA+BlueStack hotspot, so these instructions may go out of date. Initially when I tried updating my DVMEGA to v3.07, I was unsuccessful. Upgrading the firmware requires soldering a jumper wire onto the DVMEGA board, and either my soldering skills aren't good enough, which is quite possible, or something else went wrong. Despite multiple attempts, I simply couldn't get the firmware to flash to the board. Download the short PDF of bare-bone instructions titled "Manual" from the DVMEGA Downloads△ page. It shows the soldering connections for the different DVMEGA boards. 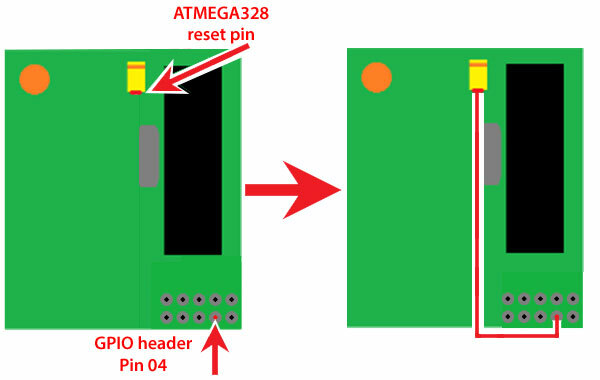 For updating the DVMEGA firmware using a BlueStack board, solder a jumper wire between the ATMEGA328 reset pin and GPIO header Pin 4. Important! This jumper configuration is for use only when using the BlueStack board for updating the firmware. When using the Raspberry Pi, there is a different configuration: Updating DVMEGA mounted on an RPi△. Note: You can leave the soldered jumper wire in place after updating the firmware, making subsequent updates much easier. Download the X-Loader app from the same place, and install it on a Windows PC. Activate the BlueStack's Serial Port to Network Proxy (ser2net) mode, which means the S1 switch (red button) must be engaged (in the latched-in position). Connect the BlueStack &plus; DVMEGA to the PC via USB cable. Check the COM port in Device Manager so that you know which COM port it's connected to, and double check that the baud rate is set to 115200. Disconnect the BlueStack &plus; DVMEGA from the PC. Start the X-Loader, and then choose the Hex (firmware update) file you downloaded, COM port, Baud rate (115200), and Device, which For the DVMEGA-DUAL is Uno(ATmega 328). Connect the BlueStack &plus; DVMEGA to the PC via USB cable again and, within 30 seconds, press the Upload button in the X-Loader app (apparently, the ser2net mode turns off after 60 seconds of being idle). An "Uploading" status message will be displayed at the bottom of the X-Loader dialog box. If the upload is successful, after a short time, the status message will change to "##### bytes uploaded." The firmware update is now finished, and the BlueStack &plus; DVMEGA can safely be disconnected from the PC. After the firmware update is completed, you can leave the jumper wire in place, so you'll be ready for any future firmware updates. You can double check that the firmware update was successful by starting the BlueDV for Windows app and enabling one of the modes, like D-STAR. The updated version should be displayed. 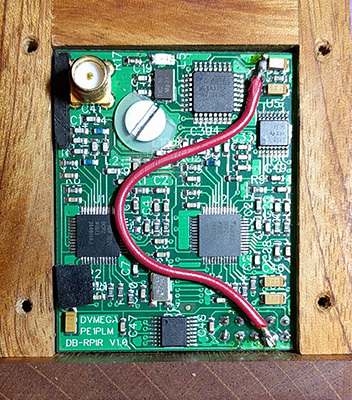 This note moved to Pi-Star Notes: Updating DVMEGA mounted on an RPi△. The difficulty I had the first time I attempted to solder a jumper wire to the DVMEGA board caused me to take a step back and consider my situation. I had a cheap old soldering iron and some old leaded solder left over from perhaps 20 years ago when I needed to do a simple task of soldering some electrical wiring together. I also had an obvious deficit of know-how. All in all, a perfect opportunity to make some improvements! The first thing that dawned on me is that perhaps it would be good to do some studying of basic soldering techniques for electronic components before I did any more messing around with pricey little circuit boards (d'oh!). I found a few articles and videos that at least helped me start to get my head out of the sand. How to Solder△ and How to Desolder△ by Aaron Cake. How to Solder△ by Boulder, CO-based SparkFun Electronics. 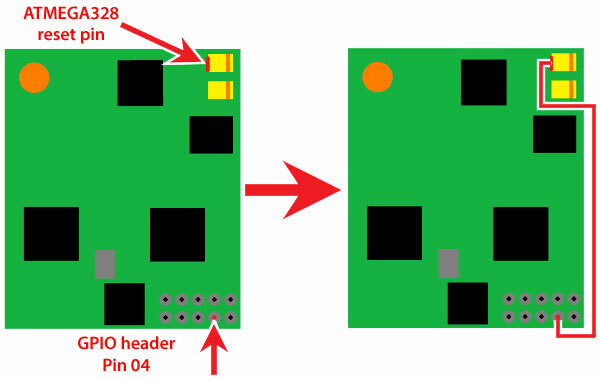 Getting Started with Soldering△ from the Raspberry Pi Foundation. Next, I realized it would be good to get a better soldering iron, one that gave me some control over temperature. There are a lot of soldering irons available in a vast range of prices, from cheap to astronomical. I decided to go with a reasonably priced soldering station from a company with a good reputation: the digital Hakko FX888D-23BY△. Even though the styling makes it look a bit toy-like, the reviews convinced me that it definitley isn't a toy, and my initial impression is that it's well made of quality components. For example, it uses a ceramic heating element, the base station is quite heavy because of its large transformer and thus very stable on the workbench, and the soldering iron holder base (which also holds the cleaning sponge and wire) is entirely metal, even though it looks plastic. One very nice feature is how fast it heats up compared to my old iron! a glimpse inside the base station. The only thing I don't like about this soldering station is its minimal controls. It's totally unintuitive how to use them for basic setup. I actually had to jump online and watch videos to figure out how to perform some of the setup (hold this button and turn it on, hold that button for one second, press this button then hold the other button for two seconds, etc.). However, once you've got it set up the way you want, the controls are just fine for regular use, which is the important thing. Heads up! Apparently there are some substandard counterfeit soldering stations made to look like the FX-888D that have been sold on eBay. Make sure you purchase the authentic unit through a reputable dealer or directly from HakkoUSA.com△. There are videos online that show the differences between the real and counterfeit stations△. After I chose a soldering iron, I read up about soldering iron tips and got a few different kinds so I'll have the right tip on hand for the job: several different sizes of chisel-shaped tips, as well as a pointed tip and an angled tip. Heat will be efficiently transferred to the workpiece, which offers easy wetting by solder. If wetting by solder is easy, the setting temperature can be set to the lowest possible temperature. If the set temperature is lower, tip oxidation is prevented. If tip oxidation is prevented, the service life of the tip will be prolonged. As you solder, your tip will tend to oxidize, which means it will turn black and not want to accept solder. Especially with lead-free solder, there are impurities in the solder that tend to build up on the tip of your iron, which causes this oxidization. This is where the sponge comes in. Every so often you should give your tip a good cleaning by wiping off this build-up. Traditionally, an actual wet sponge was used to accomplish this. However, using a wet sponge can drastically reduce the lifespan of your tip. By wiping your tip on a cool, wet sponge, the tip tends to expand and contract from the change in temperature. This expansion and contraction will wear out your tip and can sometime cause a hole to develop in the side of the tip. Once a tip has a hole, it is no good for soldering. Thus, brass sponges have become the standard for tip cleaning. Brass sponges pull the excess solder from your tip while allowing the tip to maintain its current heat level. If you do not have a brass sponge, a regular sponge is better than nothing. This turned out to be the most difficult choice. There are a lot of different solders available and it's confusing to figure out what to get for hobbyist electronics use. Compounding the difficulty of making the choice, a lot of the info available online is for industrial applications, and the opinions expressed by hobbyists vary w-i-d-e-l-y. The next question to consider is the flux, which contributes to the formation of reliable joints when soldering. Almost all available soldering wire has a flux core, but there are several different types available, each with advantages and disadvantages. The most important thing, though, is that for electronics, acid-based flux must be avoided; that kind of flux is for plumbing only and is far too corrosive for electronics. That leaves rosin flux, mildly activated rosin flux (RMA), activated rosin flux (RA), water-soluble flux, and no-clean flux. Initially, I was interested in water-soluble flux, since it's supposed to be more environmentally friendly, but as I read more about it, I concluded that it seems to be better suited for industrial applications, because the activators in this type of flux leave behind a residue that can be highly corrosive to the circuit board. That means thorough cleaning is a must; however, some components can be damaged by water, so you really need to know the specific types of applications for which it's appropriate to use this type of flux. Not so great for general hobbyist purposes. I also looked at activated, mildly activated, and no-clean fluxes, but each has downsides that seems to make them iffy choices for hobbyist electronics soldering, unless you really know what you're doing, and I simply don't have that level of know-how. That left plain old rosin fluxes. Rosin is, basically, pine sap (but it gets mixed with a lot of different things in the different formulations). Rosin flux is a decent general-purpose flux; however, rosin flux residue should be cleaned off, too. That good news is that apparently you can do a decent enough job of that with simple isopropyl or denatured alcohol, which is safer to use around most components. An upside is that, with adequate ventilation, rosin fluxes are relatively safe to use. The final thing related to flux is its percentage in a flux-core wire, which in the solder wires I saw ranged from 1% to 3%. You want to achieve the right balance between using enough to create a good bond, but not using so much that an excess amount of residue gets created and left behind. You also need to choose the solder composition, which affects things like wetness, how well it flows, melting point, etc. The Wikipedia solder article△ lists more than 150 different compositions! Each one has advantages and disadvantages that you need to weigh, for example, lead-free solder with "higher" silver content (for example, 3% vs 0.3%) melts at a lower temperature, which is a good thing, but the higher silver content fluxes I found were all activated, and I read that activated fluxes leave behind more corrosive residue. By this point in my research, my head was spinning good and fast. In the end, I chose a relatively inexpensive lead-free, 2% rosin flux-cored, Sn99.0 Ag0.3 Cu0.7 (tin, silver, copper) solder wire. Hopefully, it will prove to be a reasonable choice for my occasional hobbyist use. Follow-up note: Well, in my first few attempts to solder with my new setup, I've had some success, but some failure, too. The solder I chose didn't work well, so I looked for something else and found a solder made by the well-known company, Kester, specifically, Kester 275 (part #2470687601)△, which is a 2.2% Flux-Cored, lead-free, 0.80mm wire composed of Sn96.5 Ag03.0 Cu0.5 (tin, silver, copper), with a melting range of 217 - 218 C (423 - 424 F)△. They say Kester 275 "was developed to provide superior wetting performance for hand soldering in the electronics industry." Although it has a higher silver content and a "no-clean" flux, they also say that the "use of 275 No-Clean Flux results in an extremely clear post-soldering residue without cleaning." So far, it's working better for me that the previous off-brand solder I mentioned. It's expensive, but worth it to me to get decent results. Something new to play around with! QuadNet Smart Groups are a type of smart D-STAR routing: "The purpose of QuadNet is to support ROUTING. Routing is an alternate method of connecting to other D-Star users. Routing does NOT require your gateway to know the IP addresses of reflectors or repeaters to which you want to connect. You use special Routing callsigns in the UR field (YOURCALL) of your radio (instead of the usual "CQCQCQ") and QuadNet figures out how to get your signal to the proper destination."